Delhi is undoubtedly a traveler’s paradise. With a heady mix of heritage and modernity, the national capital exudes an irresistible charm that is hard to find elsewhere. There is so much to see and do in the city that you can easily get overwhelmed while planning your trip. But before finalizing anything, you need to find the answer to an important question – which is the right time to visit Delhi? Interestingly, the city entices all kinds of travelers – whether you are a family holidayer, solo traveler or backpacker – in different ways all year long. Depending on how you would like to explore Delhi, you can plan your visit during different seasons. To help you out, we bring to you this quick guide about the best time to travel to Delhi. Spring is when the weather in Delhi passes through a transition. As the cold and frosty weather gives way to warm and sunny conditions, it becomes pleasant to stay outdoors. While the days turn warm, the nights remain cool. The temperature often fluctuates between 20 degrees and 25 degrees Celsius. Fab Tips: Consider wearing layered clothes to remain comfortable. If you plan to remain outdoors for long after the sunset, carry a light piece of warm clothing to beat the chill. Things to Do: Spring is a wonderful time to visit Delhi and explore its various attractions without freezing or burning to the bones. Visiting the capital during Holi, which is usually celebrated in March, will allow you to witness the city’s rendezvous with colors. Another event to look forward to in this season is the Delhi Flower Show, which is among the best flower exhibitions in the country; it displays a wide variety of exotic flowers. Delhi is known for its extreme summer, and if you are planning a visit in these months, be prepared to face high temperatures. Since the city is located close to the Thar Desert, its summer is marked by hot winds and low humidity. Temperatures can reach up to 45 degrees Celsius in this season. To put in simple and straight, a visit to Delhi during these months is not recommended if your idea is to explore the city’s tourist attractions. Fab Tips: If you happen to plan a trip to Delhi during this period, we recommend that you include light cotton clothes in your luggage. Be sure to drink plenty of fluids to keep dehydration at bay, and avoid stepping out in the sun in the afternoon, when the temperature reaches the highest point. Also, do not forget your sunscreen, hats, and sunglasses, which will help you beat the heat while in the city. Things to Do: As disheartening as it might sound, your sightseeing options are limited in the summer months. You can consider visiting the city’s gardens and parks, but only in the evening hours. Additionally, the off-season hotel rates can work to your advantage. You can make the most of your summer visit by going for a few pool parties or making a trip to the water and amusement parks in Delhi-NCR for unconstrained fun and frolic. Many bars and clubs also organize summer parties, which are worth experiencing. Our blog on The nightlife in Delhi can help you know about the best party spots in the metropolis. At these places, you can even chill out with a bottle of chilled beer or a finely mixed cocktail. Gourmands can treat themselves to several street foods in Delhi late in the evenings. Think of cooling yourself off with a generous serving of kulfis, cold sherbets, mango rabri, etc., heavenly, right? You can take a walk through Chandni Chowk and discover how the medieval-era marketplace comes alive at night. In short, a summer trip to Delhi can be enjoyable if (and only if) you know what to do and what not to! With the arrival of the monsoon season, temperatures take a dip. Thanks to the medium-to-heavy rainfall in July and August, the city becomes endurable. The average temperature during monsoons is between 30 to 35 degrees Celsius, but the humidity remains high. Fab Tips: Our two cents for monsoon travelers is that you stick to light clothes as daily wear. Also, do not forget to carry a raincoat or an umbrella when you step out. Things to Do: Visiting Delhi in the monsoons has its own advantages. It is the time when the luxuriant gardens and parks of the capital take on a vibrant look. 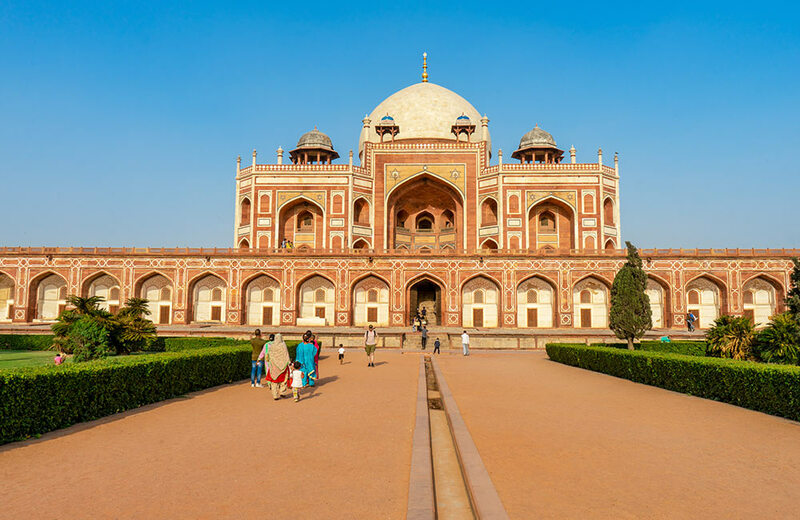 Since the tourist scene is quite lean, you can explore the spectacular monuments of the city, like the forts in Delhi, India Gate, Humayun’s Tomb, etc. at your own pace. Make sure to attend the International Mango Festival that is organized during this season. Autumn in Delhi is marked with warm days and cool nights, making the weather perfect for sightseeing and shopping. The temperature remains around 25 degrees Celsius and the high humidity also bids goodbye, making way for an agreeable weather. Fab Tips: Though you may not feel cold, keep a piece of warm clothing handy if you go out during the morning or evening hours to keep the mild chill away. Things to Do: Many people consider this season to be the best time to visit New Delhi and why not?! You can explore the heritage monuments and other places to visit in Delhi without worrying about sunburns or frostbites. It’s also the best time to visit Delhi, Agra, and Jaipur by taking a Golden Triangle Tour. Since the temperature remains low but not too low, you can indulge the shopaholic in you by visiting some of the shopping malls in Delhi. That’s not all! It’s the ideal time to explore the city’s vibrant street markets, including the Tibetan markets in Delhi, to give your wardrobe a complete makeover. Further, you can attend the International Trade Fair at Pragati Maidan every year around this time. If you plan your trip around Diwali, you will be able to witness the city draped in resplendent dazzle and illuminations. But (yeah, there is always a but), beware of the air pollution the city has become notorious for in the last 4-5 years! Like summers, the winter season in Delhi is also of an extreme nature. Temperatures can vary from 22 degrees to 5 degrees Celsius during the peak winter period that extends from December to January. By February, the bone-chilling cold leaves the city and the days start becoming sunny again. Fab Tips: Carry heavy woolen clothes, jackets, caps, and gloves to beat the chill that cloaks the city during the winter months. Things to Do: Going out in the morning hours is a complete no-no during this season because of the heavy fog which often blankets the metropolis. You can plan your sightseeing trips for the afternoons when it is generally sunny, but you will still need a couple of layers of winter clothing. If you are inclined towards cultural events and festivals, winter is definitely the best time to go to Delhi. 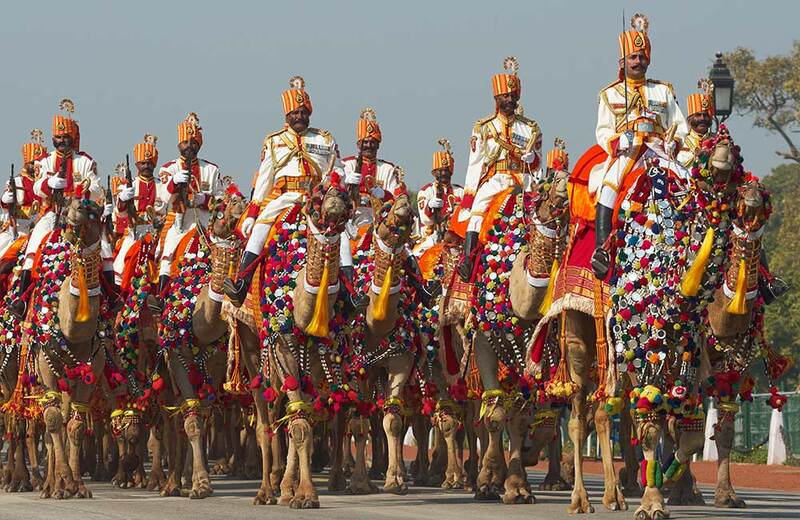 Do not miss out on the Republic Day parade or the Beating the Retreat ceremony, which are counted among the must-do things in the city during winter. Keep in mind that the heavy fog often causes many airlines to cancel their services and there can be delays in bus and metro transportation as well due to low visibility. Be prepared to face such hiccups! The cultural calendar of Delhi remains choc-a-bloc with a number of events and festivals scheduled round the year. If you want to be a part of such events and festivities, here’s a guide to plan your trip. Delhi celebrates the country’s tryst with true sovereignty by organizing a grand parade on Republic Day every year at Rajpath. Witnessing the colorful ceremony of Beating the Retreat at Vijay Chowk is an awesome experience in itself. The city plays host to a biennial automotive show, which is the largest of its kind in Asia. It involves an exclusive display of automotive technology, components, and service. Hundreds of varieties of mangoes beckon you for a gastronomic treat at this enticing festival that is a dream-come-true for mango lovers. The Delhi Book Fair is an event that will leave every bibliophile delighted beyond words. The fair boasts of offering a huge collection of rare books and classics. This mega fair, held at Pragati Maidan, witnesses many international participants and is a major tourist attraction. It runs for 13 days. The three-day cultural bonanza, called the Qutub Festival, is held at the Qutub Minar premises. It promises a fine show of various cultural art forms of the country. Now that you know what each season has in store for you, go ahead and plan your trip accordingly. Book your stay in one of the budget hotels in Delhi and let your rendezvous with this historical city begin!